The protests in the week ending 22/7/18 (involving over 90 groups) rolled across regional Australia and mostly focused on MP offices. 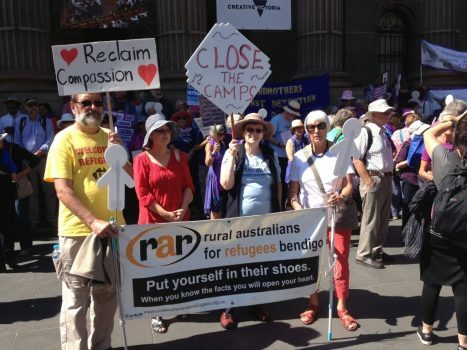 Rural Australians for Refugees (or RAR) celebrate the huge contribution migrants make to struggling country towns. The #HomeToBilo campaign is an expression of the warmth with which hard-working refugee families have been embraced. Capital city actions with witty signs followed. Images of the 12 refugees who died offshore, and a dozen empty chairs or pairs of shoes were a frequent theme across the nation. Iranian reporter on Manus Behrouz Boochani sent a moving message to metropolitan rallies. This was read to crowds of thousands in Melbourne and Sydney on Saturday. The Melbourne rally responded by singing Happy Birthday live to Behrouz (whose book on his Manus expenses is launched by Pan Macmillan this week). “Birds” a song produced in international collaboration with an asylum seeker called Moz was also launched. Traffic was stopped in both capitals. Protesters paused at Central Sydney Immigration offices to express their concerns over Australia’s disregard for human rights. Protest events were largely ignored by television and radio media in Australia but attracted foreign press. The bilateral political narrative of stopping the boats is challenged by asylum seeker advocates and activists who point to the secretive 33 boat turnbacks since 2013, possible drownings in foreign waters and, of course the huge pile up of stranded refugees in Indonesia and Malaysia. Above a quarter of a million work visas have been issued by Australia (sources available) during the same period that the 3000 men, women and children transferred offshore have been used as deterrents against boat entry. Still more economic migrants have been granted citizenship. Activists suggest that Australia’s cultural, employment and security anxiety (about being “overrun”) is misdirected. Vulnerable Rohingyans fleeing genocide are not, by nature, terrorists or criminals. Repatriations are another cause for concern. The US policy of splitting families and leaving vulnerable children incarcerated without their parents has attracted global outcry. Pamela Curr, veteran campaigner of ASRC, points out that Australia does the exact same thing here. Cuts to immigrant support services onshore mean that many asylum seekers who have reached Australia are starved of government money, food, trauma support, language classes, technical training and basic shelter during the prolonged assessment period. This in turn produces desperation. The challenges of multiculturalism are often oversimplified. Racial slurs by political figures have not helped. Mainstream Australians seem prone to selective stereotyping about foreigners. While more than happy to adopt and celebrate successful Sudanese athletes, for example, we express a xenophobic fear of Sudanese gangs. Visa overstayers who arrive by plane have not been transferred offshore. Many offshore transferees display initiative, courage, chutzpah and work skills when they first come to Australia. Though stereotyped as broken and lazy, the industrious carve out productive lives as soon as major impediments are removed. A sparky promptly repaired the broken generator abandoned by departing staff during the RPC siege last November. The authorities then came in and took it to rust elsewhere. Many have landed work in the US and show signs of thriving. The fate of the remaining 1300 seems tragic. The slow pace of traditional island life is frustrating for highly qualified engineers or academics. Although families in migration limbo are shy about drawing attention to themselves, Home Affairs propaganda that children are not actually held in detention onshore or in Nauru is challenged by images of 127 children still living in mouldy tents or containers on Nauru, where compounds are “protected” by wire. Case after human rights case playing out painfully in Australian courts map mental trauma, abuse, neglect and despair. Suppression of case details cannot hide that circumstances offshore systematically harm health as health experts like paediatrician Professor David Isaacs of Westmead have testified. The corruption that has diverted funds from effective hospital improvements on Manus and Nauru and maintained abbatoir-like conditions in (for example) the primitive Nauru “birthing suite” are also of concern. Dr Nick Martin, formerly of the navy, claims pile of unused expensive X-ray gear swelters in plastic behind the Manus hospital because there is no room and noone to run it. The misapplication of massive mixed doses of psychiatric medications by authorities and the outbreak of psychoses that followed the withdrawal of access to care in November 2017 on Manus is also of concern. West Haus is now considered a “mad house” where paranoid, broken refugees hardly leave their rooms. Curfews are also making an ordinary working life less accessible. Meanwhile, most thefts and machete attacks of refugees offshore go unrecorded and unpunished. Footage is available from ABC Melbourne and AFP via YouTube. #5YearsTooMany and #BringThemHere plus #Manus and #Nauru are the main hashtags for images. ARAN has produced a roundup of the rallies here. How can we save these people with both major parties digging in? I was going to say I feel so helpless until I realised how bad that sounds compared to the despair these people are feeling when all they did was ask for our help as they were legally entitled to do. All they want is a chance to live a peaceful life, a chance to be productive members of society, and to raise their children in safety. What the hell is wrong with us? The only way froward seems to be court action but the Australian courts are unwilling to go beyond immediate and urgent health issues. The UN should take it to the International Court of Justice but that takes sooooo long. Can’t we find our humanity? The apathy surrounding the disgraceful imprisonment of refugees is awful. I too feel helpless especially when I know that children are being born in these awful places and are unable to live a normal and healthy life. Many of my friends do not want to think about the refugees and if the subject is brought up they make sympathetic noises but quickly move on to the next topic. I have voted for the same party all my life but in any future election I will only vote for the party that is determined to release these people from their hell hole. Labor have committed to resettling those on Manus and Nauru within ninety days but for obvious reasons they can’t push this as policy right now as it plays right into Dutton’s grubby little hands. My understanding is that Labor will continue the sovereign borders policy of boat turn backs and work closely with Indonesia to stem the flow. They will take up offers from New Zealand and others (Fiji has been mentioned as has Malaysia) to resettle the people currently in offshore detention. In addition they will increase our refugee intake and, in conjunction with the UNHCR, arrange for any remaining detainees to be settled as part of a ‘swap’ program similar to that which had been anticipated with the US while Obama was in office. Having said that, I do wish that Shorten would be more outgoing in explaining his policy in advance of the election and I would really like to see Labor take on Dutton both in the policy sense and also in his electorate. Yes Terence. Their policy is better and I also believe they would be far more transparent. They have talked about an independent children’s advocate too but let’s hope they get off before that has to happen. Dutton is despicable. Ali France provides a real alternative. Dutton is going to go low in this campaign. Let’s hope he goes too far and is sent packing to enjoy his multitudinous investments and huge super payout. Interesting story about the devious actions taken by the Labor government so they could incarcerate people offshore – illegally as it turns out. There is now a bill before parliament to change the law to make the unlawful detention retrospectively legal. Well I’m confused. While I sympathies totally with the disgusting way refugees are treated here and agree previous nationalities migrating here have been beneficial for Australia’s economic and cultural development, I also observe the recent and escalating outbursts of violence in numerous parts of Europe, especially Sweden and Germany. I know I am exposing myself to ridicule and accusations of racial discrimination by mentioning this but please consider the fact many of the legal refugees arriving on our shores are military age men with reason to despise our great nation for our willing contribution to the destruction of their world . I’m not suggesting all refugees are potentially a threat to world stability but I do know if it was my country that was bombed to oblivion I would at minimum not be impressed with the nations responsible and remember it allegedly only took 18 to destroy the World Trade Centres in New York, the catalyst for the strategically named ‘War on Terror’ which is responsible for this, the largest displacement of people in history.